This California sea lion made headlines nationwide after swimming 60 miles up a river and then climbing onto the trunk of a patrol car. The Center rescued the 315-pound Chippy and when our veterinarians examined him, they discovered a bullet lodged in his head. Human interaction, such as harassment, entanglement in fishing gear, or gunshot wounds, accounts for around 16 percent of injuries seen at the Center. Under the 1972 U.S. Marine Mammal Protection Act, it is illegal to harm or harass any marine mammal. 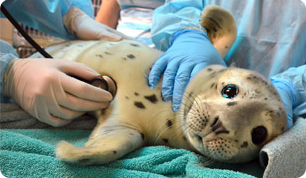 Fortunately for Chippy, the bullet was successfully removed and did not cause permanant damage; he was nursed back to health and returned to his ocean home.